Well since fall has started I've been waiting to use this pretty sig Saki made for me way back in spring. So here is Mai and Tate from Mai-Hime with a lovely fall setting. I love it. I much appreciate it my dear. Once we get up and running I'll have a request or two for you. Getting the pics together I want you to use. The Noodle Stand......makes me think of a ramen restaurant hehe. That really is a beautiful Fall My-Hime signature. I'm using the vampire knight sig that saki recently made for me. I really like it and putting it with my avatar I was able to show both of the potential couples in the show. Brad Pitt from Burn After Reading. Well, my sig is Alexander Anderson from Hellsing Ultimate. Last edited by braves on Wed Mar 18, 2009 1:58 am, edited 1 time in total. I just watched the hilarious 3rd episode of Toradora! and I just had to use this particular scene as a signature. The text is not what Taiga said verbatim, but it gets the point across. I'm currently using one of the funniest lines from Hidamari Sketch. Ah, Miyako. Well, I didn't have my previous signature for long, did I? Upgraded to animated GIF goodness. Oh, and "ArizUtaku" is my blog. BroEly posts on said blog from time to time as well. Heh-heh, that's awesome JG! I'm so glad Toradora! continues to stay strong. Episode three gave me an idea for a sig as well based on some of the nonsensical complaints it's been getting. Blasphemous! Indiana Jones would never get beaten by a punk like that. Oh, it's Indy from Indiana Jones 4. That explains it. Emerje wrote: Heh-heh, that's awesome JG! I'm so glad Toradora! continues to stay strong. Episode three gave me an idea for a sig as well based on some of the nonsensical complaints it's been getting. Thanks, Emerje! I'm interested in seeing this sig of yours. braves wrote: Blasphemous! Indiana Jones would never get beaten by a punk like that. Of course! It just wouldn't be realistic otherwise. I LOVE that signature, JediG, I was laughing for a long time. Here is Armstrong and the Armstrongettes. Because, really, who WOULDN'T want to be like Armstrong?! The quote after is one I hold dear. It's funny, but it means a lot of things about how people tick to me, and never ceases to make people look at you funny in conversation. JesuOtaku wrote: I LOVE that signature, JediG, I was laughing for a long time. Why thank you, JO! ^_^ The Armstrong GIF in your signature (and the quote) gave be a good laugh as well. There, mine's up. I find the "not tsundere" or "not tsundere enough" arguments against Toradora! rather silly. 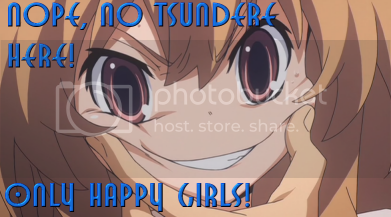 The instant I saw Ryuji force that smile on Taiga I just new I had to make a sig out of it. I'll keep it for a few days until I have time to get a Halloween theme going. before changing to the GIF of Indy getting pwned by Taiga. Switched my signature to the Princess Tutu one that Saki made for me.